Most folks I know tag themselves as value investors and yet jump in an buy hugely overpriced stocks. Well, the truth is that most of us do not have the inclination or patience to be a value investor. Let’s face it – we are all greedy and will jump in at the slightest opportunity based on how we feel or hear. That’s not what a value investor does. A value investor is a cold, thinking and heartless investor who will wait patiently for stocks to get underpriced, and he also will wait patiently and track the stock he owns until it achieves its full potential. 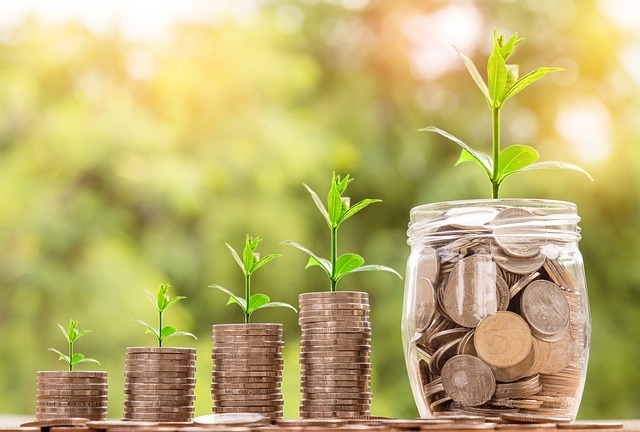 Here are the moves that a value investor makes, and if you make the same moves without succumbing to the wiles of the market, it will do you a world of good. In simple terms, the intrinsic value of a stock can be said to be the actual value of a company based on its long term projections. The idea is to buy the stock if it is available at a significant discount to its intrinsic value. It is arrived at by estimating the growth rate of a company in the long run and then applying that growth rate to the current EPS. Intrinsic value is calculated based on a formula that extrapolates the near and long term growth rates of a company and applies the calculation to the current EPS. 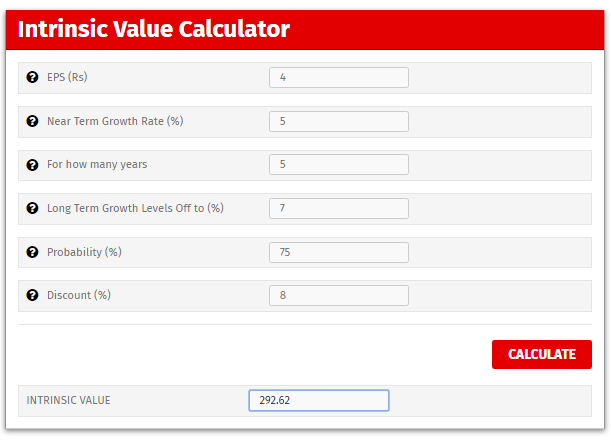 You can always use the Intrinsic Value Calculator here. Here’s an example. I calculated the Intrinsic Value of Gujarat Pipavav and found that it works up to 293, assuming current EPS of 4, near term growth rate of 5% for the next 5 years, which climbs to 7% thereafter. The probability of this coming true was set at 75%. The Intrinsic value based on these numbers worked out to 293. The CMP is 142. So, my rule of thumb says that for the long term the gain % does not appear attractive, and therefor this stock does not make a value buy at the moment. The margin of safety concept is a fancy one. In plain English, the margin of safety is the discount percentage you are getting on the stock. For example, in Gujarat Pipavav’s case, the CMP is 45% of the intrinsic value, so your discount on intrinsic value is about 55%. You may consider anything over 3x BV as expensive, or you can consider 20+PE as expensive – it all depends on your calculation. Some of the age old principles of value investing no longer apply in today’s world. If you have noticed, our world is rapidly changing. Electric vehicles, e-learning work-at-home, paperless economy, plant meats, 3D printers, insolvency processes, protectionism, etc., are reshaping the way we live and do business. Every value investor must therefore MUST keep on top of disruption. If he finds that his company cannot keep on top of disruption, he must hawk his stock. Traditional value investors in the Warren Buffett mould do not chase what the herd is missing. They go for relatively unfancied stocks that have potential to grow. In the bargain, these idiot traditional value investors missing out investing in multibaggers such as Google and Amazon. So, if you want to be a modern value investor, you must look at everything and chase a business that has a solid business model that is available at a discount. The traditional model of value investing is to buy a quality stock at a discount and hold it for several years. Of course, you should track it. Well, this does hold true. However, if you are a trader or someone who makes a living off the markets, then you cannot be expected to be patient. Think about this – top value investors say that even if your stock appreciates 60%-70% in as little as 3-4 months, don’t sell it. Keep holding. So, if you are are prepared be a Rip van Winkle to your stocks, value investing is for you. That’s all there is to know. Thanks for dropping by and reading this piece. 4 Comments on "What Is Value Investing, and How to be a Value Investor"
Dear sir, please tell how did you decide that this stock is not worth buying now as per the ontronsic value of 293. Please throw some light on this. Sir, what is Near term growth rate (%) and Long term growth level Off to (%)?